PALM BEACH, Fla -- President Donald Trump bid farewell to 2017 with a lavish party at his private club, before kicking off 2018 with angry tweets about Iran and Pakistan. On Twitter Monday, Trump attacked Pakistan, saying: "The United States has foolishly given Pakistan more than 33 billion dollars in aid over the last 15 years, and they have given us nothing but lies & deceit, thinking of our leaders as fools. They give safe haven to the terrorists we hunt in Afghanistan, with little help. No more!" It was not immediately clear why the president decided to comment on Pakistan. The U.S. has long accused Pakistan of allowing militants to operate relatively freely in its border regions to carry out operations in neighboring Afghanistan. In August, the United States said it would hold up $255 million in military assistance for Pakistan until it cracks down on extremists threatening Afghanistan. On Iran, Trump seemed to be responding to widespread anti-government protests there. He tweeted Monday that Iran is "failing at every level" and voiced support for the protesters, saying it is "TIME FOR CHANGE." While some Iranians have shared Trump's tweets, many there distrust him as he's refused to re-certify the nuclear deal and because his travel bans have blocked Iranians from getting U.S. visas. 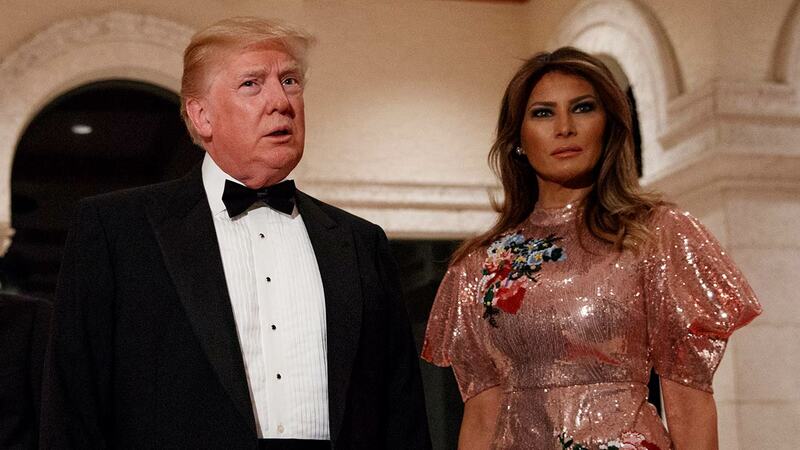 Heading into the party at Mar-a-Lago Sunday night, Trump predicted 2018 will be a "tremendous year." Trump said the stock market will continue to rise and that companies are going to continue to come into the U.S., at "a rapid clip." He also cited several accomplishments, including the tax overhaul, opening the Arctic National Wildlife Refuge to oil drilling, and repealing the individual mandate from the national health care law. Asked for his reaction to North Korea leader Kim Jon Un's remarks about having a nuclear button on his desk, Trump responded by saying, "We'll see." Guests gathered in the decorated ballroom included senior White House advisers Ivanka Trump and Jared Kushner, Trump's sons Eric Trump and Donald Trump Jr. and Treasury Secretary Steven Mnuchin. Since taking office, President Trump has made frequent visits to his for-profit properties. He has refused to divest from his real estate and hotel empire, drawing criticism from ethics experts. Earlier in the day, Trump capped 2017 with a video self-tribute touching on what he sees as the high points of his achievements and rhetoric from his first year in office. He gave a plug to American exceptionalism, too. In the video running 3 minutes, scenes of Trump with military personnel, Border Patrol agents and other world leaders are set to a stirring soundtrack as he declares of his country: "We gave birth to the modern world and we will shape tomorrow's world with the strength and skill of American hands." Trump cited his success in placing a justice on the Supreme Court, his efforts to cut regulations and his big win on overhauling taxes, which he falsely described as the "largest tax cut in the history of our country." Trump offered the video with a New Year's Eve message: "What a year it's been, and we're just getting started. Together, we are MAKING AMERICA GREAT AGAIN! Happy New Year!!" He later offered another Twitter message, loaded with his signature bombast: "As our Country rapidly grows stronger and smarter, I want to wish all of my friends, supporters, enemies, haters, and even the very dishonest Fake News Media, a Happy and Healthy New Year. 2018 will be a great year for America!" The White House said Trump been briefed on New Year's Eve security precautions around the country and will continue to monitor those efforts. Trump offered his condolences Sunday to the victims of a shooting in suburban Denver that killed one sheriff's deputy and wounded six other people, including four deputies. He tweeted: "We love our police and law enforcement - God Bless them all!"